The San Diego-Tijuana Chapter of Urban Land Institute hosted its inaugural Healthy Places Awards Gala. County Waterfront Park received an award in the Project Category. On May 11, 2016, the most outstanding and innovative projects, plans, policies, programs, and visionaries were represented at the ULI Healthy Places Awards Gala in San Diego. The Gala celebrated healthy places in accordance with ULI’s Building Healthy Places Initiative and related Principles of Smart Growth and Sustainability in the San Diego – Tijuana region. The nominees were recognized for their advanced design strategies particularly focused on the development of environments that promote healthy living in our region. The awards encapsulate places, projects, and people that truly enhance the quality of life through enriched community value, sustainable elements, prioritizing people, and thoughtful designs to promote healthy, active lifestyles. “There is so much that goes into completing a project like the Waterfront Park. I recall discussions in the proposal phase about how we could provide best value and make the largest impact with the budget available. Today, a few years later, the impact of our team’s work is tangible, the hardships of the process pale in comparison to the outcome. We are so proud and fortunate to have had the opportunity to contribute to what I see as just the start of great projects to come to the San Diego waterfront,” said Janette Tropea, Associate at SGPA. A historic site reimagined for civic and public use. Vast parking lots once engulfed a historic building on San Diego’s bayfront. Built in 1938, the County Administration Center, an art-deco building with an imposing significance to it, was envisioned as a beautiful public gathering place. Over the years, and as recently as 2014, the building sustained, but the existing landscape faded. All that really sat between the water and the County Administration Center (CAC), was asphalt. Even with San Diego’s charming Little Italy nearby and the evolving downtown area bordering the CAC, the lackluster environment on this portion of the bay indirectly rerouted visitors to seek outdoor recreation elsewhere. The space remained uninspired, uninhabited, and empty. County Waterfront Park opened in the spring of 2014, finally becoming the long-awaited “front porch” of our city. 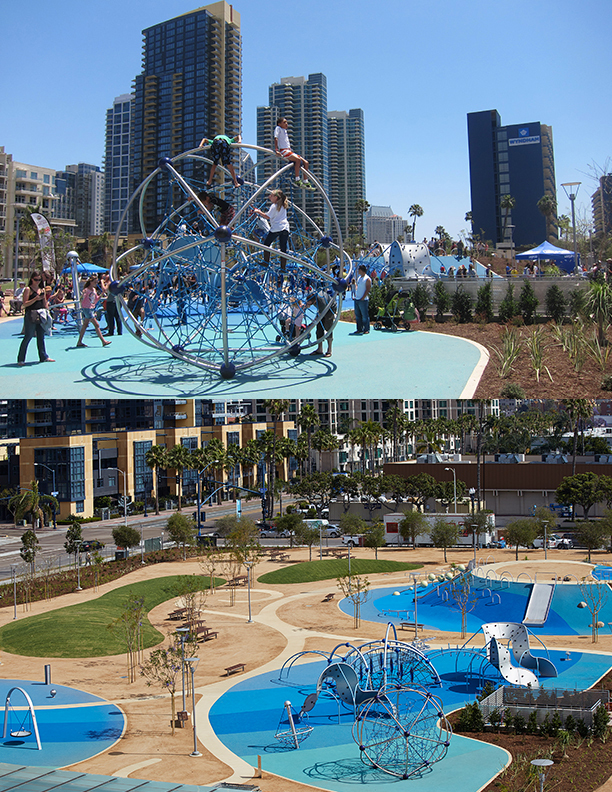 By transforming an underutilized space into the most significant green space on San Diego’s downtown bayfront, this new civic park features a promenade, two colossal greens, gardens, plazas, terraces, an extraordinary playground, fountains, large, grassy knolls, and unparalleled views of San Diego’s downtown skyline and its waterfront. The original vision came to life with a new 12-acre park and 250-car underground parking facility for San Diego residents and visitors to frequent and enjoy. This civic park has become a popular gathering space and healthy lifestyle resource for users of all ages. County Waterfront Park is cushioned by cultural amenities in Little Italy and Downtown, neighbored by water and miles of walkable routes, and fortunately located to receive stellar weather, serving as an accessible location for managing health and advocating mental and physical wellness year-round. Waterfront Park pays tribute to an existing, historical San Diego building by enhancing its surroundings with the landscape it deserves, effectively enhancing users’ quality of life in the process. “We strive to enhance everyday life through every project we take on. In our firm’s history there have been extra special projects because of their reach. Lindberg Field Terminal II back in the 90’s, the Continuing Education Building for Mesa College in 2013, and most recently the Waterfront Park. We are enjoying the acceptance it has had from the community. And we are especially grateful to the Urban Land Institute and the Building Healthy Places Award Jury for the “Grand Jewel” Award,” said Keith Pittsford, Principal at SGPA. 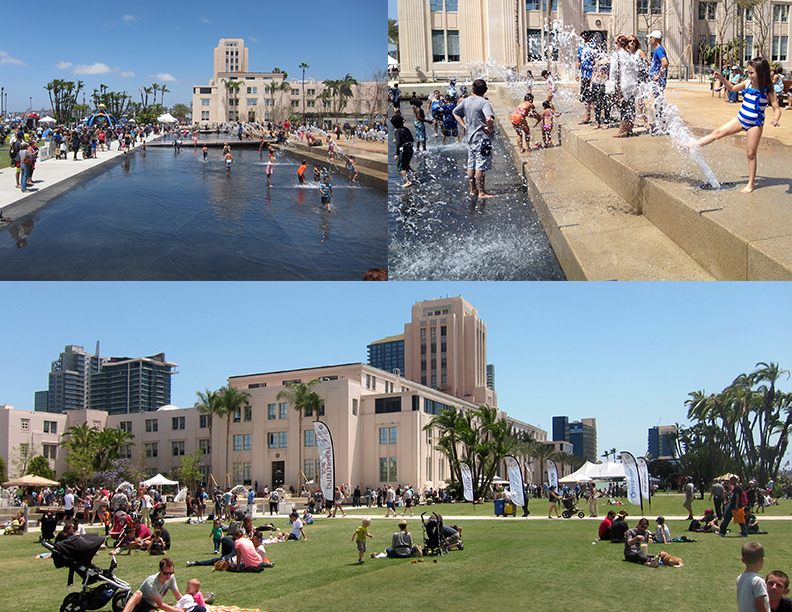 Everyday life is enhanced as San Diegans and visitors enjoy Waterfront Park. On any given day, patrons can be seen utilizing County Waterfront Park in diverse ways. Spaces and human interaction are shared, nature is appreciated and enjoyed, and healthy, active lifestyles are promoted. Much like ULI’s Building Healthy Places Initiative leverages connections to shape projects and places in ways that improve the health of people and communities, County Waterfront Park leveraged design and resources to shape a once deserted area into a thriving outdoor space where human wellbeing and the surrounding community can benefit from the Park’s presence. The very existence of Waterfront Park puts people first – the park was created for San Diegans and visitors to enjoy and know our city better, for their benefit and exposure to a healthy place. Walking trails are intertwined throughout the 12-acre park, as is a playground. The park itself sits next to the waterfront, with sidewalks for public use that are often filled with people running, biking, rollerblading, or walking. Benches, grassy knolls, playground equipment, and gardens all contribute to an active environment and foster shared spaces and community. A concession stand was added in the redevelopment of Waterfront Park and offers visitors an array of snack and beverage options. The Park is positioned to receive an abundance of sunlight and fresh air, elements that are mimicked in the design of the concession and restroom facilities through natural lighting and ventilation. Even the gardens promote inclusivity and offer a connection to community: With names like the Grass Garden, the Mediterranean Garden, and the Diversity Garden, they are scattered throughout Waterfront Park and stimulate senses further. Drought-tolerant varieties of plants were incorporated into the Park’s landscape, embracing San Diego’s natural elements and advocating for environmental responsibility at the same time. Visitors to Waterfront Park can utilize the space for a variety of things linked to their enhanced quality of life, the enhanced value of their community, and the enhanced sense of community. Images of County Waterfront Park. Design Build Team: SGPA Architecture and Planning, McCarthy Building Companies, Inc. (General Contractor), Schmidt Design Group (Landscape), International Parking Design (Parking Structure), Nasland (Civil), Jessen-Wright Structural Engineers (Structural), MA Engineers (Mechanical), Sparling (Electrical), Aquatic Design Group (Water Feature), Heritage Architecture and Planning (Historic), Drew George & Partners, Inc., (LEED), and Utility Specialists (Underground Utilities).